Folk music, especially when introduced into metal, can produce a few results. Basically, it is either highly enjoyable or the aural equivalent of Syrup of Ipecac. On occasion though, the tagline of “folk” takes on a wholly fundamental position within the metal framework and births something completely absorbing, new, and vital. 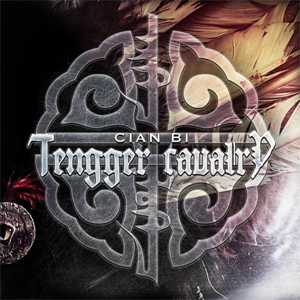 TENGGER CAVALRY embody this alchemical dance of influence and culture, reaching new heights of excitement on newest opus and apparent swan song, Cian Bi. The brainchild of noted force Nature Ganganbaigal, TENGGER CAVALRY has been covered in media as disparate as CNN and Vice in the past, and with good reason. The pounding rhythm, angular riffs (bordering almost nu-metal at times but don’t run away) and deft precision of the insertion of Mongolian throat singing along with several instruments I will never be able to pronounce assure TENGGER CAVALRY a seat at the table among some of the most perplexing and arresting music ever committed to celluloid. I think I hear a mouth harp in almost every song, and the vocalizations are, plainly, something else entirely. Cian Bi is representative of Nature’s vision, purely - an exercise both in restraint and overzealous passion for creation. TENGGER CAVALRY represent artistry that goes beyond the tropes of genre and creates something new from various parts, a Frankenstein’s monster lumbering after you in the dark, wanting a hug. But, what does it sound like? Hard to pin down. Surely the riffs are couched in crunch and heft but they are arguably not the focus of Cian Bi. Instead, the listener finds themselves immediately engrossed in the elaborate instrumentation of everything not dependent on electricity and being so sick, bro. And that is where TENGGER CAVALRY really shine: they are folk musicians of the truest sort, using modern technology to augment and amplify ancient ways to make people feel things. The overall sound of Cian Bi is experimental because it can be nothing else, including brief forays into electronics drenched atmosphere. I must confess that I am late to the train of TENGGER CAVALRY and am truly saddened at their apparent demise. Cian Bi is a triumph as art, but not necessarily as metal in its purest sense. In the interest of art, and feelings, TENGGER CAVALRY have achieved a remarkable work. Will it bowl you over with heavy? Yes and no. Is that feeling of heavy a hydra? Absolutely. Music, it has been said, is a universal language. Translated however is appropriate, thank you, TENGGER CAVALRY.